UpContent provides various ways to filter and sort the content you find. Learn more about them here. UpContent now allows you to filter your results by the source from which the content came from. You can either eliminate a source from your results, or view content solely from that source. To hide suggestions from a particular source, simply "uncheck" the source name from the list on the sidebar. To view suggestions from a single source of your choice, click on the number next to the source name. The default time parameter for the suggestions in any topic is 30 days. 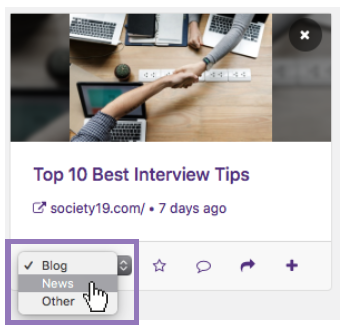 If you'd like to see more recent content, or content from a wider range, you can do so by selecting from one of our pre-set options or by entering your own date range up to one year. In the latest version of UpContent, you will also see a checkbox labeled, "Undated Suggestions". By clicking this label articles found within the time constraint you specify will also be returned - even if we are unable to identify the exact date of publishing. When sorting by "Recency", undated articles will appear at the very bottom of your list. There are 4 different sorting options: Relevance, Recency, Shareability, and Influence. You can filter between these by selecting them from the sidebar. Relevance: Displays results in order of most applicable, based on the topic criteria. Recency: Sorts results by most recently published, in descending order. Shareability: Displays content in order of how likely your audience is to engage with the article. This is based on the article's use of power words and phrases within its title and body. See more on this below. Influence: Displays content in order of the most influential sources based on the topic criteria. Influence is derived by understanding the relationships between the articles and domains within your specific topic - and not the macro influence of the broad internet. See more on this below. Shareability is a proprietary score that we assign content based on its propensity to be shared. Core factors include the presence or absence of an image on the page, and the presence of certain words in the title and body of the content that research has linked to higher clickthrough rates. Influence is a measure of an article’s ability to drive other content to reference it. We measure influence by defining a network of all of the links in your result set. 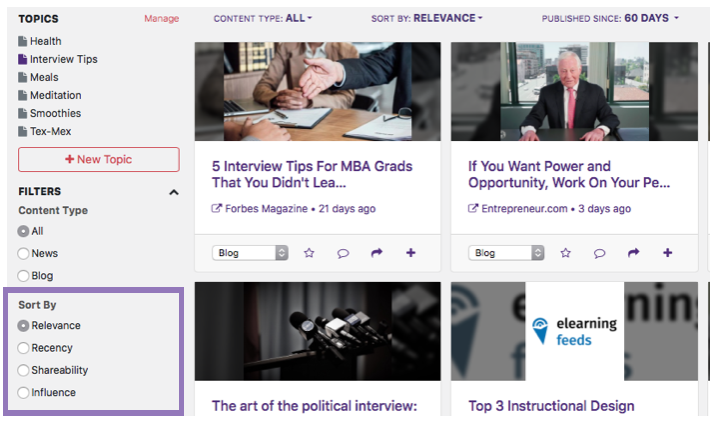 helps us determine which articles are at the center of a particular conversation, helping you find the sources of a that are leading the discussion. UpContent uses proprietary machine learning software we've called ArtClass (short for Article Classifier) to determine if content is a blog piece or news article. You can filter the articles using this classification by clicking on "News" or "Blogs". Note: ArtClass isn't perfect and is still learning. If you see a suggestion that you think is classified wrongly, you can fix it by selecting a new classification for us and others.